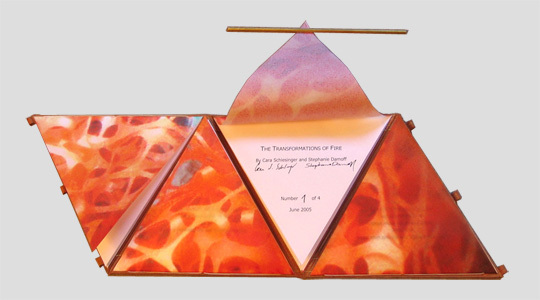 “The Transformations of Fire” is an archival tetrahedronal artist’s book, which takes its shape from the form given by Plato to particles of fire in Timaeus. The book is the realization of the first stage of a series conceived of solid books, each dedicated to and taking the form of the other elements and to the transformations—by means of their solid form—between them: air/octohedron, water/icosahedron, earth/cube. 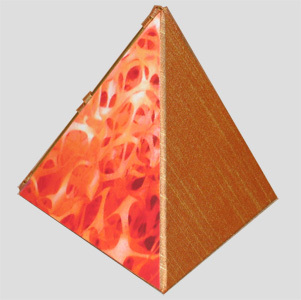 Air and water, like fire, are also composed of triangles, the recombination of which is said to facilitate transformations between physical states. 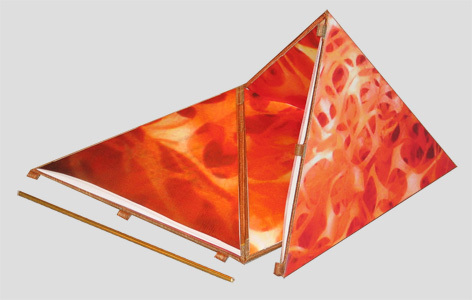 The tetrahedron, held closed by a brass rod, unfolds to reveal on each of its four interior triangular faces conceptual digital photographs of fire and text excerpts from Timaeus on the transformations of fire. "The Transformations of Fire" was exhibited in "The Elements" at the Hunterdon Museum of Art, Clinton, New Jersey in August 2005 and in "PhotoWorks" at Abecedarian Gallery, Denver, Colorado in March 2008. Edition of four.